> It seems that a Chinese GANGSTER may have lost his phone. It seems that a Chinese GANGSTER may have lost his phone. 08:57 | It seems that a Chinese GANGSTER may have lost his phone. Photos recovered from his phone have made their way onto the internet causing a viral sensation ( Over 500,000 in half a day). 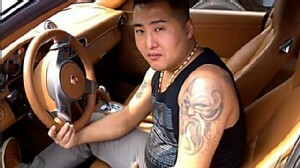 Ever wonder what’s it’s like to live the life of Chinese thug? 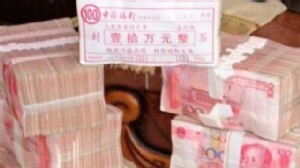 You get to pose with stack of 1.1 million yuan (just over $174,000) in 100 yuan bills. This rather vain individual couldn’t resist documenting himself reveling in the Chinese gangster lifestyle, which apparently requires spending a lot – and we do mean a LOT – of time with his shirt off. How else would he display his tasteful collection of body ink? In addition to the cash, this unidentified individual proudly lets his tattooed gut hang out as he poses with a fleet of Porsches and BMW SUVs, a cute puppy and his Louis Vuitton man-purse and an array a gaudy gold accessories. Just to be sure no one questions how ruthless he actually is, he photographs his fellow thugs doling out punishing beating to another individual on what looks like a secluded dirt road or driveway. It is not immediately known who this individual is, but there are some clues. He poses with two Porsches registered in two different cities: a Porsche Carrera with port city Tianjin plates and a Porsche Cayenne SUV with Beijing plates. Of the two cars it seems like he has more clout in Tianjin, evident by the quadruple 8888 on his plates. Numerology figures in very prominently in Chinese culture and 8, being a homonym for “good fortune” in most Chinese dialects, is an especially auspicious number. All 8 license plates are usually reserved for the especially privileged whether by power, fortune or connections. So whoever this puppy-loving, murse carrying thug is, he or someone he knows or works for was able to put down a lot of money for those plates. According to a 2008 report by Austin, Texas- based intelligence firm Stratfor, China’s organized crime syndicates are heavily localized, exerting considerable influence over corrupted local politicians, but rarely outside their immediate sphere of influence. As the country’s economy rapidly developed so did their fortunes. The Chinese government estimates that there are over 30 million involved in organized crime across the country, but Stratfor says the government has managed to keep these groups disjointed and unable to spread their influence across the country. There are no indications that this particular individual, who has had the misfortune to lose his phone, is connected to organized crime but the lingering question is with all the money, cars, tats and thug lifestyle, why does he looks so lonely? That could explain his ”come hither” look while stroking a stack of cold cash.